My first attempt at helping students answer these questions was by putting together the Startup Tools Page – a compilation of available web development tools. While it was a handy reference, it still didn’t help the novice. So today, I offer my next attempt. Thanks for the comments, suggestions, corrections, and additions. Updates added. Thanks Steve for sharing this. Add deployment process for testing and staging environments which allow you to be super agile. Similar to Google appengine, if updating your environment is a one command step, it greatly helps in the future when you are trying to rapidly release. For Rails there is capistrano, Fabric for Django etc. I’ll collect all the suggestions and update the post when I get a few more. Years back they called it vaporware –software sold before it existed. I am of the belief that you sell it first — get a check and then build it. So how do you do this. Create a PowerPoint document that shows different features functions and use that as your sales tool. Use it to close on the benefits of the service. You don’t need to build a site to test the viability of your idea or even sign up a customer. (I’m looking at B2B) But you do need something that helps the prospect visualize the product/service. The is an approach that a good product manager would use any way and it is a nice first pass at product concepting. I’ve used this method a lot and it works well. It allows you to start selling and get a great read on the market before you commit any dollars to development. When you do have developers, it gives them a road map to work with. In fact, you can use odesk and find some $15 per hour programers that will quickly work up your PP document into a demo site. We’ve used this approach to bring our SaaS site to market. I’ve never farmed out dev work of any significant magnitude. How do you protect the end product? Meaning, how do you prevent the developer from using the idea/code/product themselves or selling it to others? Or is this a moot point in that you just need to do it, hope for the best, and move on? Sounds like the recipe every entrepreneur is looking for. Thank you so much for sharing this. Thanks for sharing all these ideas. We are following you and these concepts since we launch our last web venture at Spain 2 months ago. These ideas helped a lot since our venture is a new concept that needs to be tested. I just wanted to thank you for this information. I don’t think you really understand how valuable something like this is for someone like me: a non-coder on the other side of the country where I don’t know any other coders. I’m originally from Compton California, but I’m currently at UNC Greensboro finishing up my thesis. I’ve been developing a web startup idea for the past five months and “The Four Steps to the Epiphany” has been helping me a lot so far. 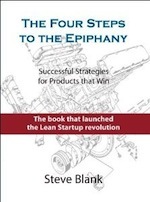 I just purchased Eric Ries’s “Lean Startup” so I know that will give me great insight, but the information you just posted here has really given me great information that appears to be able to help connect where I am now to where I will be when I start applying the knowledge presented in “The Lean Startup”. I just wanted to thank you for this because for someone like me I always ask myself “what’s next” and according to your steps I would say that I’m in the beginning of step 5. 1.) I was wondering if you had any advice for finding a cofounder, specifically a technical cofounder. I know this is something that will have to be done sooner rather then later if I wish to really pursue this. 2.) Would it be possible to meet up with you? I will be in the Bay Area in October the week of the 17th. If it was at all possible to meet and talk with you in person that would be great, even if it was only for thirty minutes. Let me know if this is possible. It’s much more powerful than simple tools like Balsamiq and even as a non-graphic designer, it allows me to create much more rich UI’s, which I then hand off to a designer to “make it pretty”. The designer delivers layered PSD files which I then get “sliced up” into HTML/CSS but cheap online services like CodeMyConcept.com or HTMLBurger.com. Google Adwords terms doesnt allow you to “harvest information”. I once set up a site on a sub domain to unbounce, selling product x.
Adwords shut my account down. They said it looked like I was trying to get leads only. I wasnt, i was trying to to get orders to see if there was a demand. Adwords can be very strict. I would also recommend you tell your students to copy and paste “personal information text”. Not sure what the name is. But info what you do with customers information (mails etc). Adwords demands that too. At least warn them about adwords being able to Ban them for life and that they should read the terms. Why do you recommend this instead of a fake sign up/order form? Wouldnt the latter give more reliable data to decide if there is a demand. Is it moral reasons? 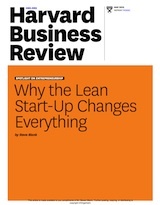 I am in the midst of building my own lean startup, and having a list of resources like this is very helpful. I got your link from micropreneur.com. Now even an old non-coding Army guy like me can have hope. As Mr Ezell said above, this sort of thing can really mean a lot to non-coders, and especially to us born-before-the-internet types. The problem for us age-enhanced heroes is not just the buzzwords, but the fact that there is SOoo much material available to try to choose from and learn that it becomes an off-putting task just to think about it. Please, Please ,Please archive this post so I can refer folks to it. Post is archived by being a permanent link on the “Startup Tools” page. When searching for profile handles check out knowem.com. Checks the availability on a whole bunch of sites. Good for branding. Thanks for the knowem link. Added it to the startup tools page. Great resource. I put all the tools up on Gangaroo.com for future reference by other lean startup fans. It felt good to read this post since we, at CloudBees, followed many of the steps outlined here. Not all of them though but it’s never too late! One word on where startups can run their applications => CloudBees is ‘the’ PaaS for Java apps or any language that is compatible with the JVM. As important, if not more, is that our PaaS has a unique and compelling capability, startups can store their code (safely), build their application (with a Jenkins-based SaaS), test it and auto-deploy (to staging or production), and obviously run their application and scale DUO (down up out) all from the same platform. And still be 100% Java compatible, no lock-in, all 100% Java and MySQL standards. We are happy to host already a few interesting startups and/or mobile back-end services. Did I say I just love your blog posts? I do. Thanks for sharing the great article Steve. There’s a minor typo (missing 2nd “s”) in the link to Slideshare. This seems like a wonderful class. We are also in an just the right place to start on this class. I am curious if any of your student groups are willing to partner with start ups like us to go through the customer development process. We can act as their technical implementation wing and they can assist us with brainstorming ideas and analyzing feedback. We have developers and designers on board and are currently using lot of the tools that you have mentioned and planning to use the others that you have mentioned as we go through the process. Great step by step guide! Sounds like a good course. Thanks for all the links to the various resources. I get most of the steps, but as a non-coder, what do you recommend as a real life approach to taking on ‘Step 6: Build a more complete solution’. Using somewhere like Elance to outsource? Taking some time to learn PHP, SQL? How long would be a realistic ‘training’ period? Finding a local business to meet face-to-face and take your specification to build the basics? Getting a technical person into the startup team full time/as a contractor? Thank you for putting this post (and this list) together! This post will save many months of searching&wasting time for many startups hopefuls. Excellent and informative post. Thanks for sharing. A couple of typos: it’s Node.js (not Nodes.js) and it’s jQuery (not Jquery). I know it probably doesn’t matter in your world, but for technical people (who you write these sections for) it does. Thanks for “step-by-step guide”. I want to translate this into ukrainian for my blog. Can i do it? Yes, with attribution and a link to the site. What a great resource! 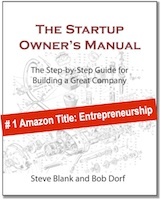 I’m providing this to my marketing students, many who have web start-up aspirations. Thanks Steve – An excellent and practical guide as usual! We’ve started GetViable to do exactly this – accelerate idea to MVqP using crowd-sourcing and offshoring. The idea is to get more startups to the ‘pivot or proceed’ stage in 8 to 12 weeks. We’re finding many non tech founders with awesome ideas but unable to get started, and we’re helping them get a product out there to attract tech co-founders and check viability. We’ll definitely be pointing them to this excellent resource for context and guidance. Steve, that’s just awesome…. thanks for sharing. Namestation.com and nameboy.com can also help should your desired domain name not be available. Not all of them though but it’s never too late! One word on where startups can run their applications => CloudBees is ‘the’ PaaS for Java apps or any language that is compatible with the JVM. The described point 10: “Ask for money” is much harder to be successful. To gain a bank credit in germany currently your businessplan has to include too many details, which slows up your start-up. In the meanwhile your start-up idrea has not seldonly its copy allready in the net! Many thanks indeed for sharing such vast resource pool. Its certainly a very exhaustive list of resources I have ever found on the net. I am sure its just not an effort of days and nights rather years. We are also trying our level best to provide valuable resource to start-ups and individuals who are sincerely doing hard work and want to succeed. How about some options for a decent looking WordPress theme? Someone looking to start a business will be drowning in minutae and inactivity if they tried following even half those steps. Name ONE successful business that has actually done those steps Steve. Name one! Great post nicely laying out the major steps of the lean startup process as they apply to specific technology. I would also add that PaaS platforms are now expanding to go beyond just hosting and thus covering more and more phases of the cycle. WSO2 App Cloud: http://wso2.com/cloud/app-cloud (disclosure: I work for the company) is one such example, covering now: issue/task/feature tracking, development (including in-browser IDE), testing, operations, application lifecycle management, version switching, continuous integration / continuous deployment, etc. So for technical startups, tools are getting more and more comprehensive. that is an awesome guide thanks for puting the time into this really appreciate it. Just wondering when it was last updated…..since it started back in 2011… things have changes so would appreciate knowing if all the information is still current. First, many thanks for sharing this extremely useful and valuable information! I am a non coder who is trying to start my own internet business which requires a website with a good amount of features and applications in order for my product to work. I looked at the website builder tools mentioned in this article but they all seem to be only suitable for a blog or online store type website. How can I go about building this website I need? Can I hire someone to do it?